« Tao & MoMu dare you! Finding your way through the beautiful streets of Antwerp doesn’t have to be difficult. 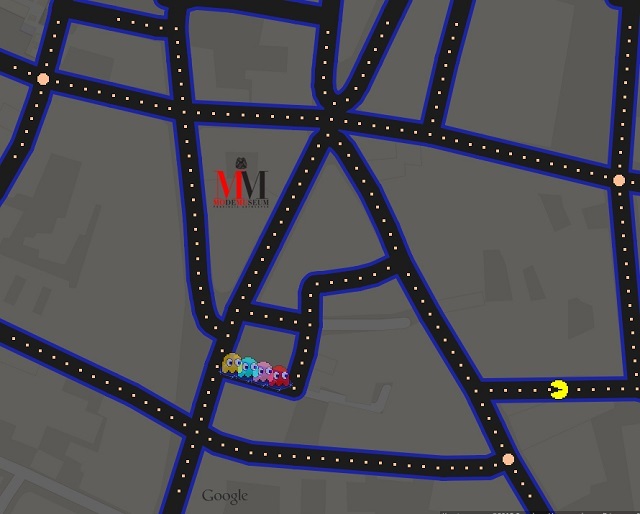 With the new Pac-Maps, created by Google, you can navigate your way to MoMu, simply by going up, down, left or right. If you can make your way past the ghosts (maybe pick up some cherry’s on the way) you can come visit our exposition Dries Van Noten Inspirations at MoMu. On the 31th of march, Google launched PAC-maps to give people the best possible experience around them. Whether this launch was an early April fools’ joke or not, we like it. After wasting some time at time at the office, secretly collecting pac-dots on our phones, we wanted to share this fun little game with you. You can use the #PACMaps on Google Maps on your desktop and the latest version of iOS and Android. Click here if you want to play the game (only works on Google Chrome and Mozilla Firefox). After you finish, you can share your score with @MoMuAntwerp via the share button. This entry was written by David Flamée, posted on April 7, 2015 at 12:19, filed under Press&PR and tagged Antwerp, Google, MoMu, PAC-maps. Bookmark the permalink. Follow any comments here with the RSS feed for this post. Both comments and trackbacks are currently closed.